InfoTrack & PEXA provide you with a seamless journey that allows you to move through the entire conveyancing process electronically. InfoTrack's integration into your practice management system now includes electronic settlement through PEXA. 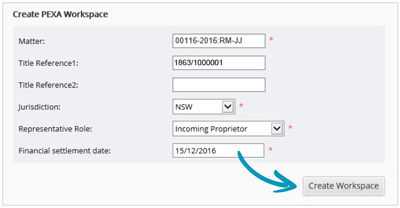 You can create, launch and manage your PEXA workspaces in InfoTrack with all of your property matter information mapped directly into the workspace. You can complete the process digitally to avoid the hassle of printing, collating, scanning and posting, and there is no need to rely on couriers and settlement agents to get the job done.